I’ll start by saying I’m a bit lost on all fronts creative at the moment. My last big Thing was my November gig, which went well But. I can’t quite put my fingers on what I wasn’t happy with (beyond the usual feelings of I didn’t practice enough, didn’t prepare enough, didn’t plan what I wanted to talk about enough etc - I think I’ll always have those feelings tbh), but it’s starting to hold me back as I feel as though I can’t quite move on from it. I have a few trusty websites I like to look at when I’m feeling Stuck in this way, and one of them belongs to American writer Alexandra Franzen. I especially love the long list of her favourite articles. A message that Alex likes to transmit through her writing is - keep trying, you never know who’s listening - and I find this very heartening when I’m struggling. The article I went to this time is here - based on a beautiful quote from Martha Graham, whose work I don’t know much of, but whose dance academy I follow with great interest over on Instagram. I’m struggling in particular with a book I wrote a couple of years back, about my creative journey back to music. At the time of writing it, I was coming to the end of an inspirational mentorship programme with harpist DHC, and I was deeply in touch with all things creative and working with great discipline. I was also backed by a small but immensely supportive and utterly inspirational accountability group. I wanted to do a 100 Day Project, and having failed at doing a musical one previously, I decided to do a writing-based project instead. My book, 60,000 words of it, is what came out of that project. It has a beautiful cover, designed by a talented graphic designer, and I am halfway through the first edit of it. I am unlikely to be able to afford to get it professionally edited, but I would like to publish it in some way, which I have researched and I know I could do relatively easily. This post was meant to be about keeping the channels open (hence the title), but as I type these words, I am feeling how important that book is to me, and how when I sit down to write something else, all thoughts turn to that instead of whatever I intended to write about. The words that are standing out from that quote are, “It is not your business to determine how good … nor how valuable nor how it compares with other expressions” and it is totally the fear of what others might think that is stopping me from sharing my book with the world. I’m out of practice when it comes to squaring up to that fear - I’m still recovering from a pretty intense sharing activity the last time around, and I don’t know what to do about all this. This is silly, because a few of those trusted, supportive group members have read parts of my book and gave me the most wonderful feedback. This post is a way to get back into the habit of writing. It’s unfinished, and a bit ragged and disorganised, but I’m going to hit publish now because if I don’t, I might not come back for a while. Not the October just gone but they one before, I fell in love with a coat. It was the most beautiful, soft, ruby red coat, made from wool and cashmere and from a very fabulous Italian label that is known for making excellent coats. I very nearly bought it. I posted on Facebook and Instagram about it, and many more people joined in the discussion than I had expected. It would have cost me a fortune, far more than I would normally spend on a coat, and far far more than I ever thought I would even think about spending on a coat, if that all makes sense. I had not longed for something in this way since I saw a grey metallic leopard print Mulberry handbag in 2008, (which was a similar price to this coat). I couldn’t afford that handbag, and I couldn’t afford this coat. Well. I could afford it if I didn’t buy any other clothing or shoes that year. I don’t spend a huge amount on either of those, so I decided I could have it IF I was really sure I wanted it. After a lot of thought, I realised that rather than wanting the coat, what I actually wanted was to be the sort of person who would wear that coat. Someone with long glossy hair, with a beautiful handbag, who always looked effortlessly Done, with an elegant scraped back ponytail and done-but-not-Done makeup, who looked good in skinny jeans and could buy normal sized knee length boots because they didn’t have legs like tree trunks. Someone like my old boss from years ago when I worked in the fabric shop and who had one of these coats but in the classic colour (which I am not a massive fan of). Someone like Carla Connor. I am a huge Coronation Street fan and Carla Connor is my favourite, as a character and as a style icon. (She’d wear this coat in black though). I have loved clothes and fashion ever since I was a child, thanks to my Gran on my Dad’s side who always insisted we watch The Clothes Show when she came to visit. Her thing was embroidery, and she taught me so many different stitches, and most importantly, she gave me an eye and a feel for beautiful things. And yet, when I leave the house to go to work, or to do anything that isn’t playing the harp or running, I feel like a total shambles. There’s a huge disconnect between what is in front of me in the mirror and what is in my own head, which is still an overweight child with horrendous thick glasses. Combined with that image, for a long time, I’ve been trying to clear some pretty large debts that were incurred following a divorce, a disastrous house sale,and then the purchase of more than one harp. I’ve always managed to stay in a decent day job that has allowed me to deal with all this and avoid financial ruin, but one of the things that has suffered has been how I feel about myself and particularly about my physical appearance. It doesn’t take a lot of money to look good, and I manage to look fine on not much money at all really (apart from a bit of a weakness for good skincare). But I always feel this is the area where I have to compromise, and I don’t like it so I am going to change it. I wish I could use my clothes as a bit more of an expression of my personality, rather than just as outerwear to ensure I am decent for whatever the task in hand might be. And so, I found a perfectly sensible decent plain black coat for 5% of what the beautiful coat would have cost me, and I’ve worn that since, and every time I’ve felt sad because it wasn’t the beautiful coat but it was the sensible option. I listened to a wonderful podcast a couple of weeks ago while I was running, and I had that glorious feeling where you think the person is talking just to you. It featured someone who is a fashion history expert while being in recovery from an eating disorder. It has helped me to work a few things over in my head about clothes, how I feel when I get dressed, and what I love versus what I wear. The clothes I often choose to buy and rarely wear are dramatic, extrovert, sparkly and/or brightly coloured and/or wildly patterned. Somehow when it comes to getting dressed every day, these clothes are pushed to the back of the wardrobe in favour of safer options that are often approaching the end of their useful life. This needs to change, it’s important to me and how I feel about myself. Fashion can be destructive of course, but it can also be a wonderful way to express creativity and have fun and enjoy beautiful things. I doubt I’ll be in the pages of Vogue any time soon, but I’m really looking forward to seeing what emerges when the spring comes. I’ve still been dreaming of that damn coat and the person who would wear it, and so as a result I’ve been looking for something similar, and cheaper, ever since. This week I found it, half price, the exact same label (although a cheaper line) and same colour, no cashmere, but with a better neckline and an eminently more affordable price tag. My new coat has been dispatched and I can’t wait to try it on. ….But let’s not talk about the cobalt Mulberry Bayswater I saw a few weeks ago…. One of my main goals this year is to write more. Of all the creative things that I missed doing while I was ill through December, it was writing that really called out as something i needed to devote more time to. And so, this is the first post in a new chapter of blogging. It’s January (just!) so I thought I’d write a little about where I’m planning to direct my time and energy this year. I’ve always struggled with this. My life has changed so much, and so quickly, and so often, that being able to look more than a couple of months ahead has always felt very, very hard. A close family member - my beloved aunty Sylvia - was killed in a dreadful road accident a few months after my 17th birthday at the age of 39, and I think a big part of my resistance to gazing into the future is related to the shock of her death. But. In September last year, I signed up to an online workshop to tackle how to pack all the creative stuff I want to achieve into the number of hours I actually have available. (It’s a great course, I’d really recommend it). I adore the course leader Jessica Abel’s work, I admire her methods and find them extremely useful and so I committed to doing all the exercises and activities no matter how horrible and uncomfortable they felt. January also brought a workshop by the wonderful harpist DHC in which she invited us to write down some goals for the year, during the workshop, within a group. I couldn’t see any of these people, but there was something about the community and combined energy of selected strangers off the internet, and so I dived right in. There I was. Me, never looking more than a couple of months ahead, with a list of one year goals and a five year vision. I’m not sure how much, or when, or how, to share all these. I’m not sure how much, or when, or how, or what to share about all the other stuff. Money - the debt demolition rumbles on, but this is a long term journey and there are some other objectives, mainly to have an emergency fund. I’d like to save £1000 and tuck it away. My friend and former colleague Angela used to refer to being a dragon guarding her treasure (not in an obsessive way, just being choosy what she spent her cash on) and I like this image. Running - I want to complete the Eiger Ultra Trail E101 race this year. I can’t believe I got an entry in the 45-odd seconds before the race sold out, and I am willing to work really hard towards this. 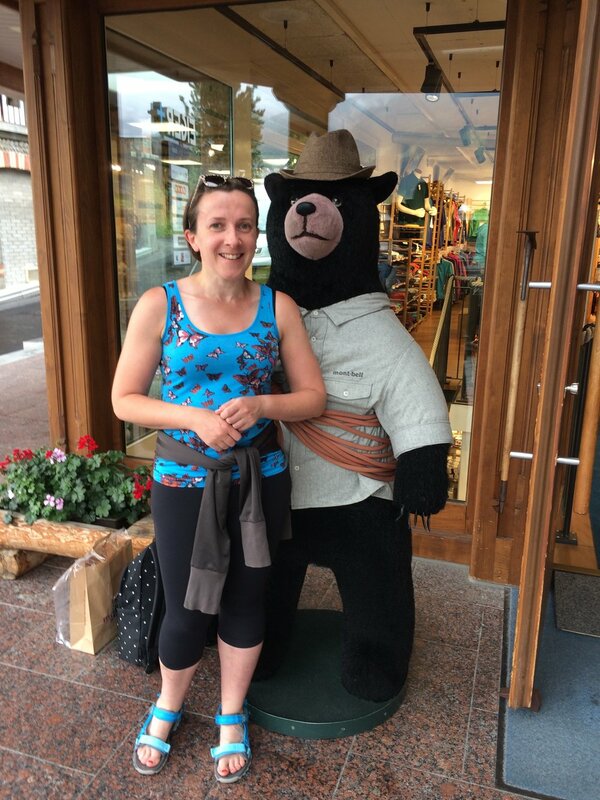 I really want to get a picture with this gorgeous bear (who lives in Grindelwald, across the road from the race finish) again, but wearing my finisher’s medal this time! The Book - in the midst of the mentor ship/coaching programme I did with DHC a couple of years ago, I wrote a manuscript for a book about my creative journey and my struggles to find my way in the musical world. It has been simmering away for a while, I have a gorgeous cover ready to go, and I think I’d like to self-publish it to find out more about how that all works. But I’m scared of putting it out into the world, despite having received some wonderful initial feedback when I shared bits of it. I definitely need to work my way through this as I am fed up of it taking up brain space with no outcome! The simmering is reaching boiling point! Home life - this went through a monumental change last year when I experienced epic levels of grief following the loss of my beautiful greyhounds, and then I somewhat unexpectedly fell deeply in love. I’ve moved house, I’ve had a complete change of lifestyle and though it’s still in transition, I want to feel comfortable and settled in my new environment. Harp - last year was a huge year and I am still Processing it - emotionally due to a huge vulnerability hangover from my last gig, physically due to illness over the winter in the aftermath of the gig and moving house, and digitally due to a big stack of video footage of said gig. I want to get back into regular practice to keep my stamina and technique going strong, and I want to continue on the journey of Finding My Own Way. I’m in a good place with Harp stuff at the moment and I want to keep it that way, while continuing to push myself creatively. I think that’s enough to be going on with! I’ve committed to sharing my thoughts in at least one post a week, inspired by one of my creative heroes Brendan Leonard who posts regularly on a Thursday and Friday. I’m not sure how this will come about, but I’d like 50 posts on my blog by the end of the year and I’m willing to work hard to make this happen.